Send live audio and video to a smartphone or web browser anywhere in the world! The Cisco-Linksys wireless-N internet home monitoring camera connects to your network wirelessly, and delivers a live audio/video stream to a smartphone or browser anywhere. 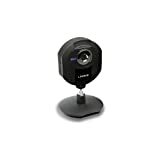 Also captures video streams and sends email alerts with video clips upon motion detection.